• birdhammer.com - birdhammer.com is the location of 'Life on Rubber Roots', the personal blog of Chyrese (a.k.a. Kitty). Much of the blog is devoted to her thoughts on full-time living in her home-built truck camper and to photographs of its charming interior. Like many blogs, it's difficult to navigate around but it's worth reading, if for no other reason, for the warning on the unforeseen consequences of fitting a wood-burning stove in such a small space. • cellule amovible pick-up - the personal site of a French demountable enthusiast. It feels incomplete and hasn't changed for a very long time. • cruiserart.com - fancy a classic camper but can't afford the real thing? Get yourself a picture instead! • eHow.co.uk - the ehow website is UK registered but all of the demountable-related material on it is generated in the US and either just states the obvious (like 'How to Select a Truck Camper for a Pickup Truck', or 'How to Choose a Camper for Your Truck') or is over-simplistic nonsense (like 'Building Your Own Truck Camper'). • freepatentsonline.com - demountable camper meets bendy bus! One from our strange-but-true department but it might be of interest if you can't make up your mind whether you want a truck camper or a trailer caravan. Why not have both?! • hitekhomeless.net - Hitek Homeless is the blog of a young couple, who introduce themselves as Johnny and Jenn, living full-time in an Arctic Fox truck camper. The blog includes some useful observations on the constraints of living in a small box as well as a helpful list of organisations offering, one way or another, work camping opportunities. • johnosoriobuck.com - the truck camper as artwork. In his 'Utopia Eight' installation, Californian artist John Osorio-Buck constructs his version of the classic truck camper, and its contents, in order to explore its place in American culture and the deep-seated mythologies that are embedded in it. There are pictures of his work and explanations of his ideas on this page of his website. 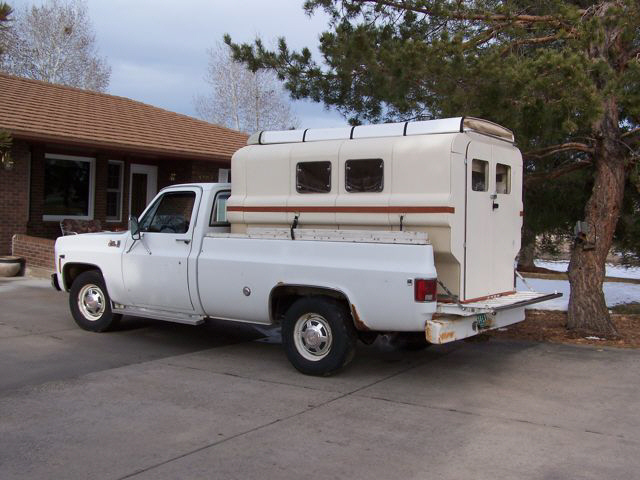 • kommst-du-mit-zu-bishi.de - a cautionary tale, on Jochen Sprenger's blog, of his attempt to get legal redress against the dealer who sold him a Mitsubishi L200 when "dramatic deformations" appeared in the pickup bed while carrying his Nord Star demountable camper. The text is all in German (Google Translate does an adequate job of translating it) but it's the few photos which really tell the story and are a useful reminder of how badly things can go if a camper's tie-down system is not appropriately located or fixed. • koransky.com - Andrew Koransky's website devoted to the Aliner Truck Cabin, a folding demountable. Although Aliners are still being made as trailer caravans the Truck Cabin is now out of production I believe. • laura-n-sasha.com - Laura and Sasha Jevtich's website describes in part and in great detail the trials and joys of full-timing in a demountable - a life many people would describe as impossible! They also run a fifth-wheel. 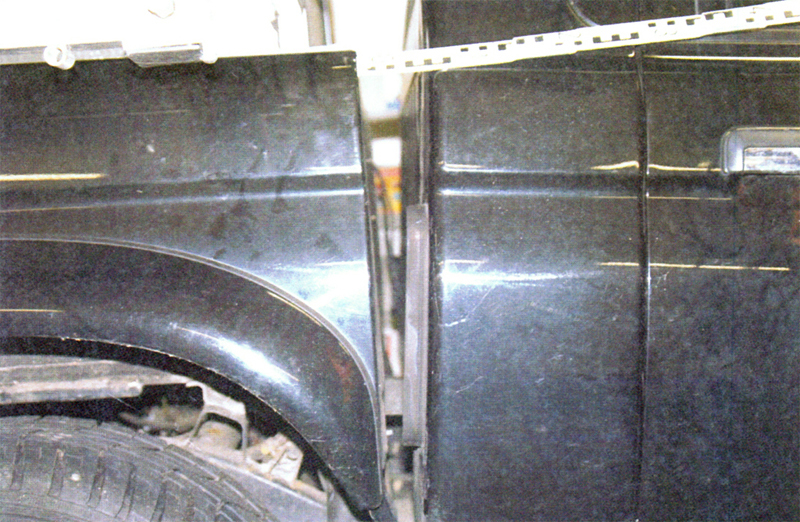 • matzenman90 - matzenman90's 'Pickup to Wohnwagen' posting on YouTube offers another cautionary tale, to add to Jochen Sprenger's above, about getting your pickup and camper properly matched and securely fixed together. Yikes! • mellomikeswolfcreekcamper.blogspot.com - as its name implies this is a blog by someone calling themselves Mello Mike who travels in, and writes about a Wolf Creek camper, among other things. • natcoa.com/largecamper - a description and pics on the NATCOA forum of what might just be the world's largest demountable camper. It's certainly big but you have to ask "Why"? You're hardly left with a nippy runabout when you've taken the camper off, are you?! 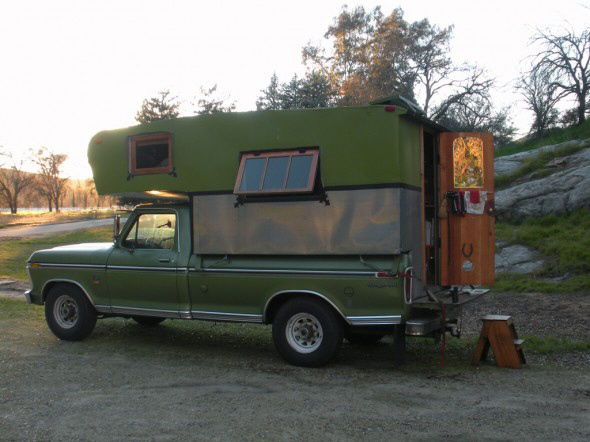 • redneckexpress.blogspot.com - Matt Rivard's blog about life with the 'Redneck Express', his 1973 truck camper in which he lives full-time. As well as tales of life on the road, it includes quite a lot of material about modifications and repairs that he has made during the last six years, some of which you certainly wouldn't get away with on European roads! 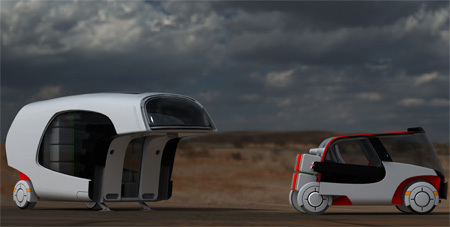 • synchro-link.com - Dennis Sattler's somewhat confusing website (he seems to collect www domains) about his 'Synchro-Link' system, an interchangeable body system similar in concept to the Truck Transformer (see below). He has demonstrated its potential for carrying a camper body by building his own (see rolloffcamper.com on the self-builders' blogs page). • tealinternational.com - Not exclusively a demountable camper but Colorado-based Teal's innovative, modular design can be carried or it can be towed. It can also be taken apart for storage, be expanded by adding modules, or even be built as a shelter! What can't it do?! • thewoodcrafter.net - if you fancy building your own demountable but doubt whether you have the necessary skills or time, here are the plans (free - in .pdf format) for you. It couldn't be simpler, but don't expect too much! • 'Truck TAG' - the curiously-named Long Dog Enterprise's 'Truck TAG' is not strictly speaking a demountable pickup camper but it is a camper that can be demounted from a pickup! More closely related to the 1970s Born Free (see similar but not the same) than anything else it's an interesting idea. Sadly this clip on YouTube, and another one here, are now the only links as the website www.longdogent.com seems to be no longer available. • trucktransformer.com - Truck Transformer is a "truck body swapping system" built by Simpson Innovations Inc. One of the suggested applications of their system is for a demountable "hybrid motorhome" which they can also sell you. • ukcampsite.co.uk - the COLIM is a German project that has been featured on a number of websites including UKcampsite. Designed by Christian Susana and described on one site as being a "cross between a fifth wheel caravan, a demountable motorhome and a normal caravan and car", it is actually closest in concept to the 'clip-on' campers on our similar but not the same page. • walzenbach.de - 'The Story of the Bog Queen' is Janina and Joerg Walzenbach's extraordinary and entertaining account (in English) of how they acquired their Chevrolet pickup and Lance camper. Buying the pickup through a German dealership was fairly straightforward, but buying the camper through American eBay, unseen, was either crazy or courageous. They certainly bought more than they thought they were buying. If you're thinking of buying through eBay, read this! • where-rv-now.com - another blog from people full-timing in a demountable. Although none of it is current - there had been no new additions since 2005 the last time I checked - there is some interesting and useful material hidden away among Teresa Petrykowski and Sterling Udell's musings. 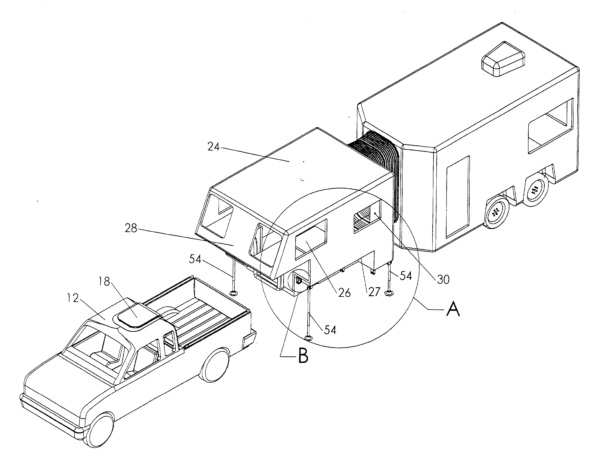 • wipo.int - another from the strange-but-true department, this is a 1991 patent application for a "five-panel system for pick-up truck camper shell" which, presumably, never got off the paper! If you click on the 'Documents' tab you can see a drawing (in .pdf) of the system. This page lists demountable-related websites and blogs which I have come across and which don't really fit anywhere else on the site and so they end up here. A few are interesting, some are entertaining, one or two are bizarre. Whether any of them are actually useful I guess depends on what you're looking for! If you find dud links here, please let me know.